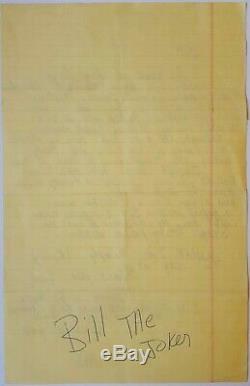 Michael Jackson incredible autograph letter signed. 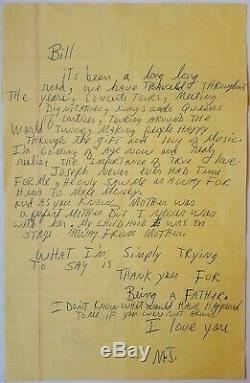 A moving, intimately personal letter from Michael Jackson to his longtime security guard Bill Bray. The letter reads in full. It's been a long long road, we have traveled throughout the years, concerts tours, meeting dignitaries, kings and queens of countries, touring around the world twice, making people happy through the gift of and love of music. I'm coming of age now and really realize the importance of true love. And as you know, mother was a perfect mother but I never was with her, my childhood was on stage away from mother. What I'm simply trying to say is thank you for being a father. I don't know what would have happened to me if you were not around. The reverse is addressed in Jackson's hand to. Accompanied by an MJJ Productions sticker pass and a color glossy 10 x 8 photo of Jackson fondly cradling Bray's head in his hand. Bill Bray had begun working on the security team for the Jackson 5 in the 1970s, and remained as Michael Jackson's bodyguard and close confidant until his retirement in the mid-1990s. A remarkable personal letter by the'King of Pop' to an important figure, commenting on the traumatic childhood that impacted him for the rest of his life. One page, 8 x 12.25, no date but likely circa 1992. The letter has passed Roger Epperson's quick opinion service. We always stand behind the autographed material. The item "1992 MICHAEL JACKSON amazing heartfelt autographed letter signed after Beatles" is in sale since Friday, April 5, 2019. This item is in the category "Music\Music Memorabilia\Artists/ Groups\Michael Jackson". The seller is "london_collectibles_limited" and is located in London. This item can be shipped worldwide.